Still, I’m happy to have managed to get this up tonight. 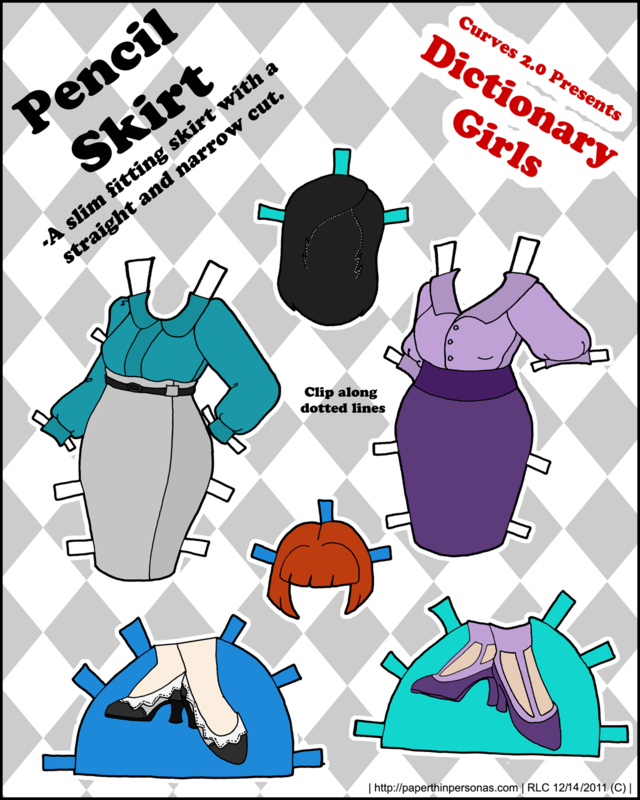 I’ve been neglecting all the paper doll series lately on the blog (except Shadow and Light, but truth be told I had those posts drawn and reformatted before I left, so the time is lessened considerably). I should probably put together a list of things to do for the blog for the new year, but at the moment I can’t think of much. There’s always post more regularly, but I’m not sure I’d pull that one off even if it went on the list. What would other people like to see done around here? First things first- These are not historically accurate. Now, I must say I do love skirts. I’m beginning to learn how much I love them in the last few months. I’ve started wearing them a lot more and I am really enjoying it. Pencil skirts are wonderful, because they are simple and easy and go with everything. Of course, I don’t own a crazy purple one (though I did really want a green tweed one until it was pointed out that it went with nothing else I own). 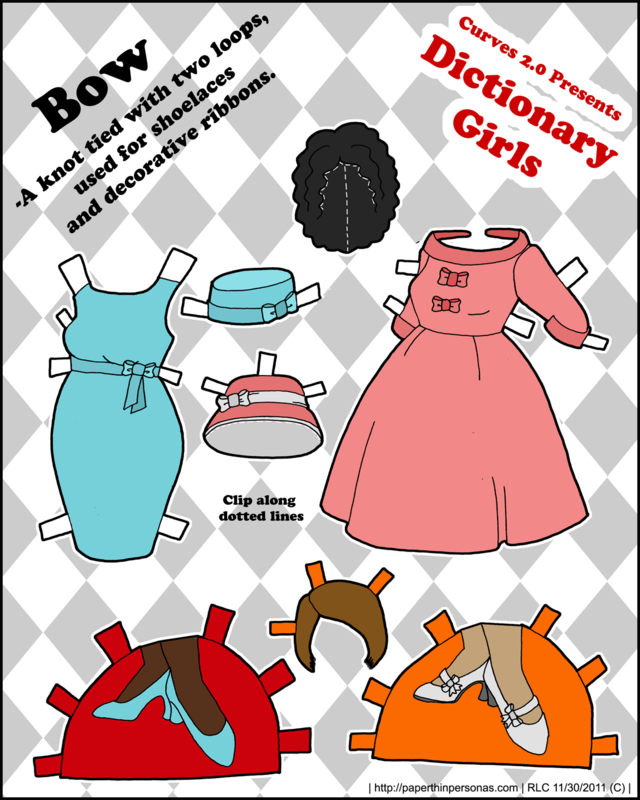 As with all of the Dictionary Girls paper dolls, the color of the stand should match up with the paper doll whose skin tone will match the shows and the color of the tabs match the hair to the doll they are intended for. The hair styles are more interchangeable than the shoes, due to that pesky skin tone problem. These shoes and wigs are intended for Alyssa and Chiharu . I still feel like they need a larger wardrobe before I begin to make more dolls- though I would like to make a brunette with blue eyes soon, but that will have to wait until finals are over- so sometime next week. Life has a way of getting crazy and getting away from me, but I finally feel a little more on top of things after a few weeks of nothing short of total insanity. I finished a paper for one of my classes and that leaves two more to write and one final to take. Not terribly bad, all things considered. The first hard frost of winter hit the corn fields, and my car today. So, I guess I should be tracking down my wool socks and getting ready for the long cold winter. Personally, I would rather it stayed fall a little longer, but I doubt its going too. I think winter is actually here. Since the winter is coming, I decided to go pastel for these vintage inspired dresses. I wanted to make the sorts of things I imagine a Southern woman wearing to church… of course, being neither Southern or having ever gone to church more then twice in my life, I have no idea if anyone would actually wear it to church. Still, I like them, but the black wig might not fit under the pastel green hat. This beautiful sent of cocktail dresses was meant to show off ruching which I have been practicing. I love the combination of the apple green and the strawberry pink, but also wanted to have a more sedate color scheme for the less adventurous among the Dictionary Girls. 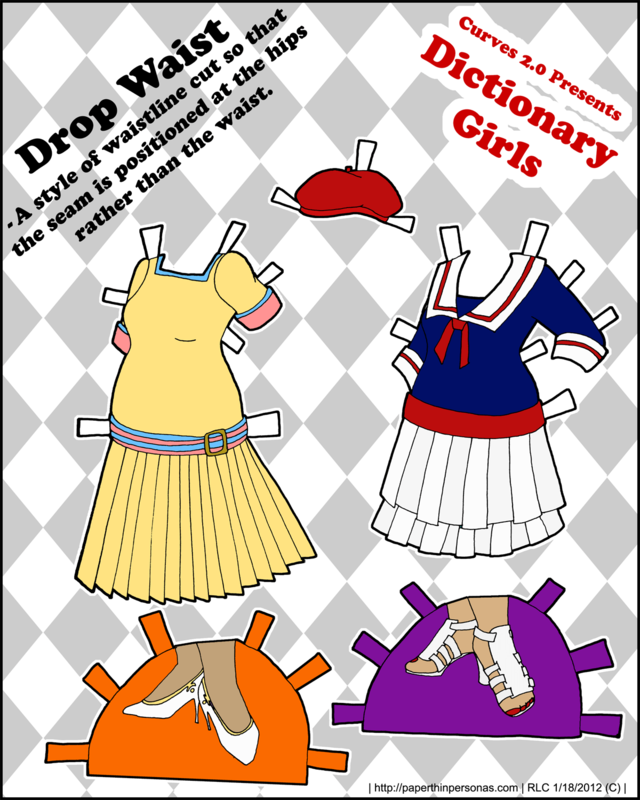 I am pleased with how both dresses came out, but I sometimes admire the work of other paper doll artists and know I need more practice. Lately, I have been very impressed by Siyi Lin an artist from Taiwan, I think. Her work is beautiful and often featured in Haute Doll Magazine. She has both a webpage and a Picasa album which I confess to staring at for far too long. I love her colors and her drape and her faces. 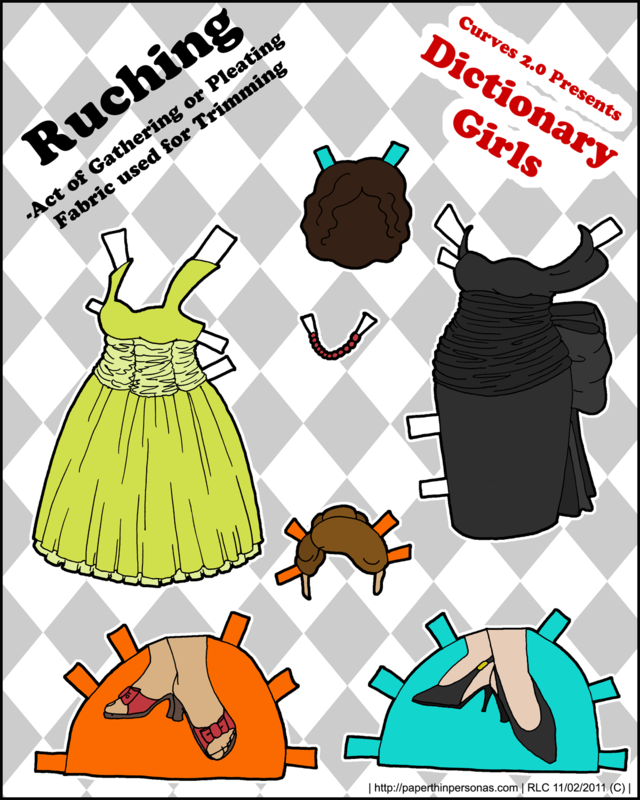 I think her paper dolls are done with vectors and that is something I really want to learn how to do. Someday, I’ll have the time to take a class on vector drawing. Yes… I’ll fit that in between my classes, work and job hunting. Not any time soon, I fear, but someday. 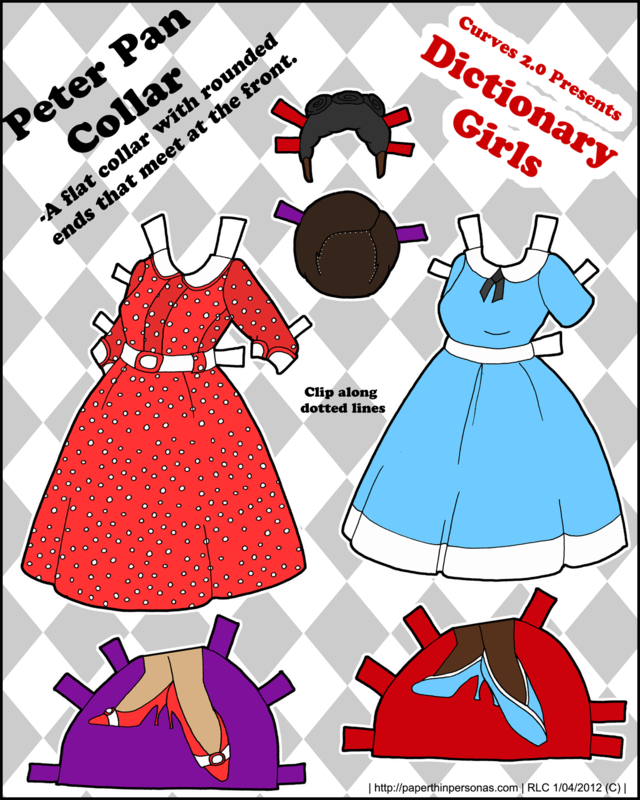 But I’m really inspired by her paper dolls of Ann Estelle and Betsy Mccall and I wonder about doing a child paper doll. I’ve played around with them in the past. It would certainly be a paper doll of a doll rather then a real child. But this brings up a deeper more complicated issue of what should I do with paper dolls that aren’t part of my standard series, and I don’t have an answer. I don’t like the Gallery, but I don’t know what to do with the content I have there and the Short Run dolls were fine, but I haven’t used them in a while. I need to somehow consolidate the paper dolls that are not part of a series under a sort of umbrella category somehow… What do people like more? A gallery approach or something else? Does anyone, but me care? Possibly not. As I mentioned before, I am focusing on clothing for the Curves 2.0 for the next few weeks. 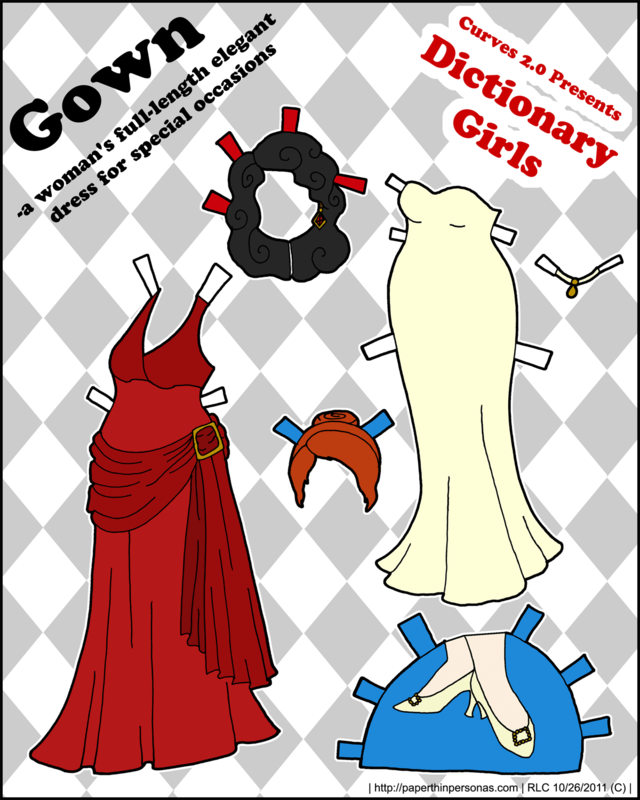 I figure my five girls need some dresses to wear, or else they shall be poor cold paper dolls. As much as a paper doll can be cold, I suppose. I always did like drawing clothing far more then I liked drawing dolls, to tell you the truth. I just feel like I should have a nice set of dolls before I start drawing lots of clothing, even if clothing is more fun. It’s rather like eating veggies before the deserts. 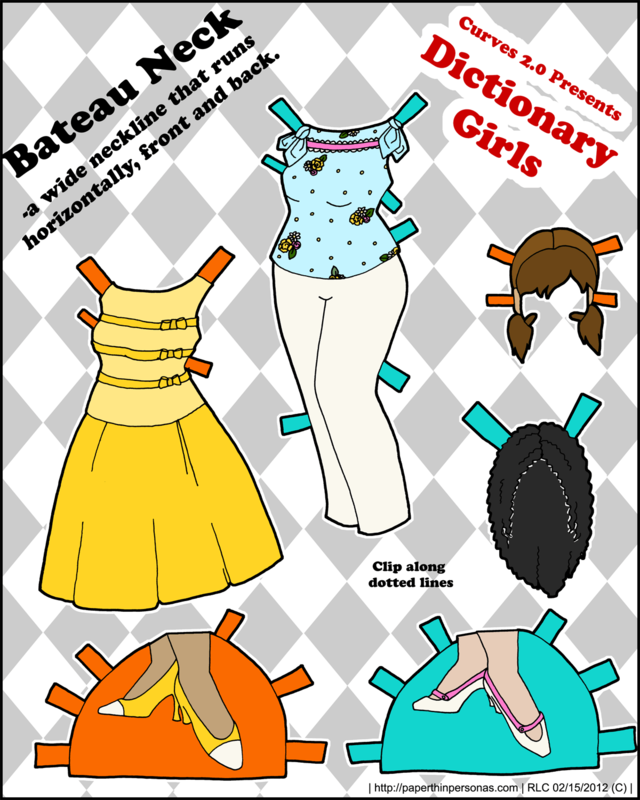 Speaking of eating my veggies, during my absence from the blog, I did some drawing of paper dolls, though not related to my usual serial dolls. After some debate, I thought I would ask how people felt about seeing things from my sketchbook that might never make it onto the blog.